We now offer the option of TEXTING 1(307)674-4111 during business hours and we can text back! Dr. Pelissier founded Mountain View Veterinary Hospital (MVVH) in June 2004. MVVH offers superior care and is proudly accredited by the American Animal Hospital Association. This accreditation ensures our clients and their pets are receiving the very best in veterinary care. MVVH has upheld this accreditation since 2009. Mountain View Veterinary Hospital strives to be among the leaders in our area. It is our desire to provide the highest quality medical and surgical care to our patients and offer the best possible service to our clients. Our organization of veterinary professionals and paraprofessionals are dedicated to serving our clients and patients with the utmost care and compassion. We will always strive to treat our patients in a kind and humane manner as well as utilize the latest technologies and services available. We never forget that pets are family members and they will be treated accordingly. MVVH proudly opened our new facility at 2026 South Sheridan Avenue in October of 2015. With the construction of this state of the art facility, the doctors and staff of MVVH are now able to practice the highest quality medicine and surgery. “I extremely happy with the care you give Shasta each month knowing that you didn't give up on her when she had her accident means a great deal to me, you always make her and me feel so much better. Thank you!” - Virginia Coleman 2/21/17. It is the belief of MVVH that communication is paramount to what we do on a daily basis. It is our goal to ensure that clients are given all of their options and clearly understand them. Lab and test results are explained thoroughly to each and every client with the objective of making our clients feel comfortable with all the information they have been given. 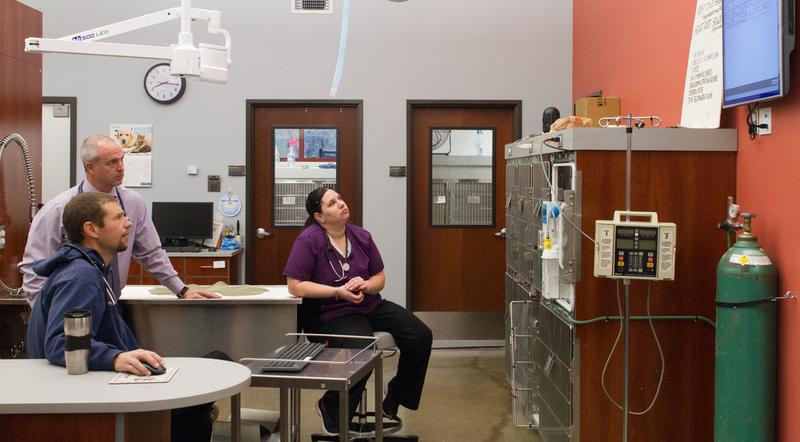 To confirm health and status at home following a visit, our nursing staff engages in daily follow-up phone calls to each individual client in order to answer questions and address any concerns you may have with regard to your pet's current condition. To enhance internal communication, grand rounds occur every morning which consists of sitting down as a staff and going through the day and every appointment, surgery or drop off we have scheduled. This is a crucial 'first step' to our day and enhances our interactions with our clients, ensuring we hold ourselves to a gold standard in communication. Our veterinarians are happy to come meet you face to face and shake your hand. We value the personal relationships we build with our clients and prefer the individual relationships with our clients that we have. We welcome you to our family! You can expect exceptional care when you come to Mountain View Veterinary Hospital. We pass over 900 standards of veterinary care and excellence. 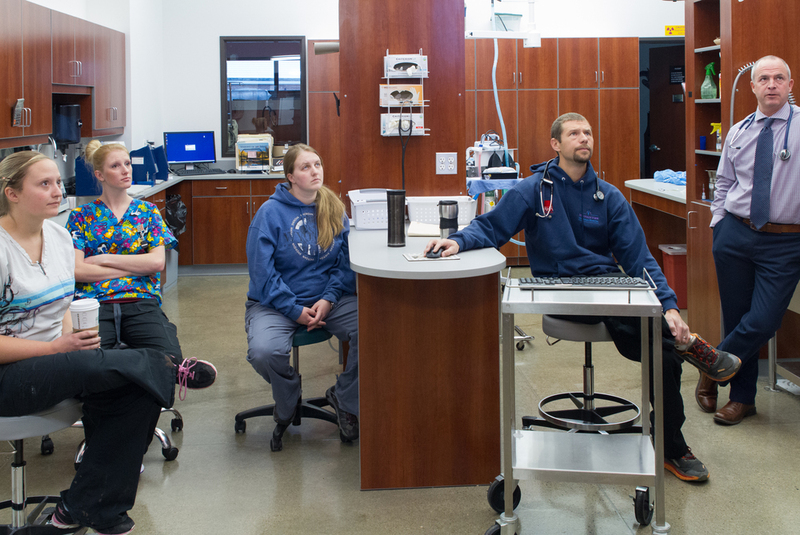 Mountain View Veterinary Hospital is an organization that strives to promote continuing education, allowing our staff to enhance their professional growth. 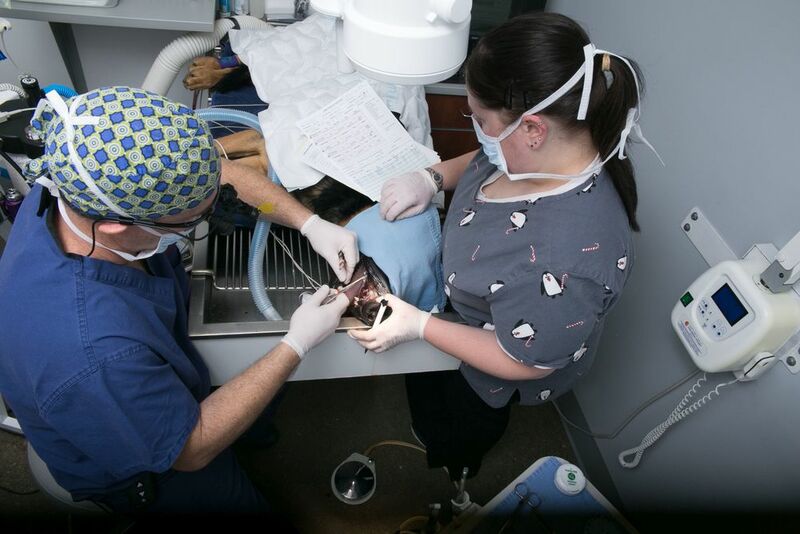 MVVH is dedicated to hiring and employing only licensed Veterinary Technicians. It is a our goal to ensure that our team members provide an excellent customer service experience and uncompromising care for our patients. is an advanced surgical procedure to repair the cranial cruciate ligament. 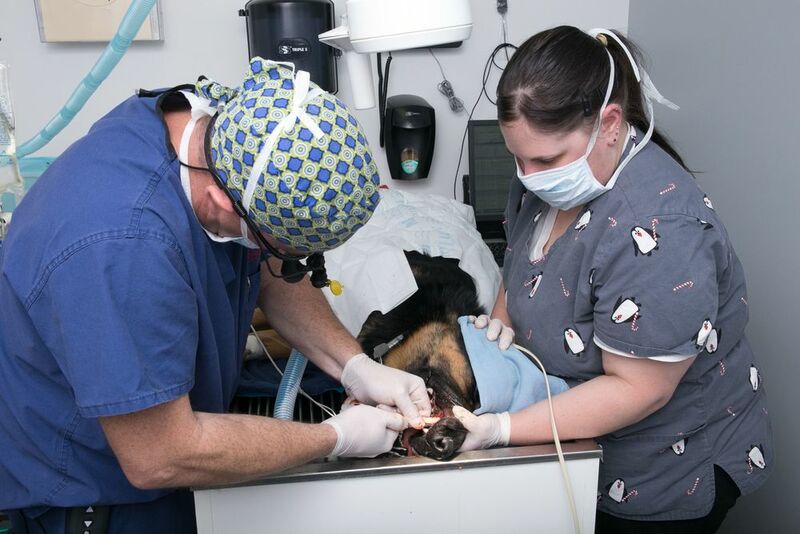 Dental disease is one of the most common problems encountered in our pets. Routine evaluation and dental prophylaxis (cleaning) is necessary to promote optimal dental health. Mountain View Veterinary Hospital is privileged with a staff that can perform a multitude of different animal care procedures and services. Our clinic is one of the only clinics in Northern Wyoming to offer AAHA (American Animal Hospital Association) accredited care, meaning your pet is in superb hands. Beginning in 2015, Dr. Chris Newton and Dr. Peter Pelissier began offering the TPLO surgical procedure. Refer to our "blog" page to read more about this type procedure and what it involves. Dr. Chris Newton making the initial incision on a TPLO surgical procedure. Fill out one of the client surveys to the right. 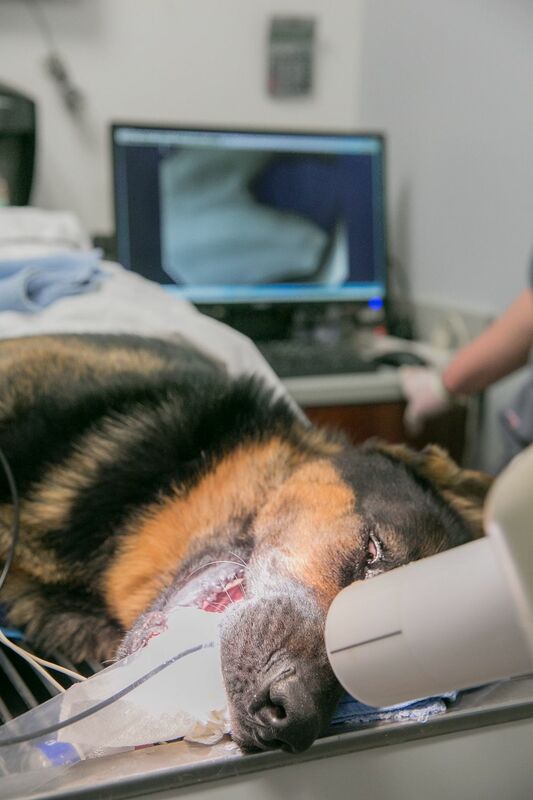 To remain as progressive as possible, our veterinarians use ultrasonography to diagnosis the health and status of internal organs, including echocardiograms. We are very proud of our new hospital facility, located at 2026 South Sheridan Avenue. 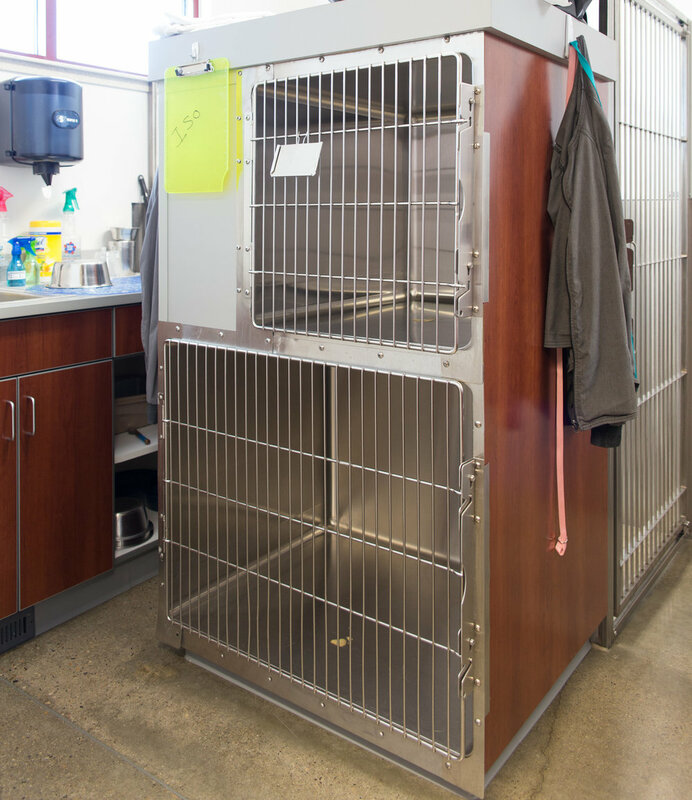 This facility was designed with the specific intention of providing your pets with the latest technology and comfort. 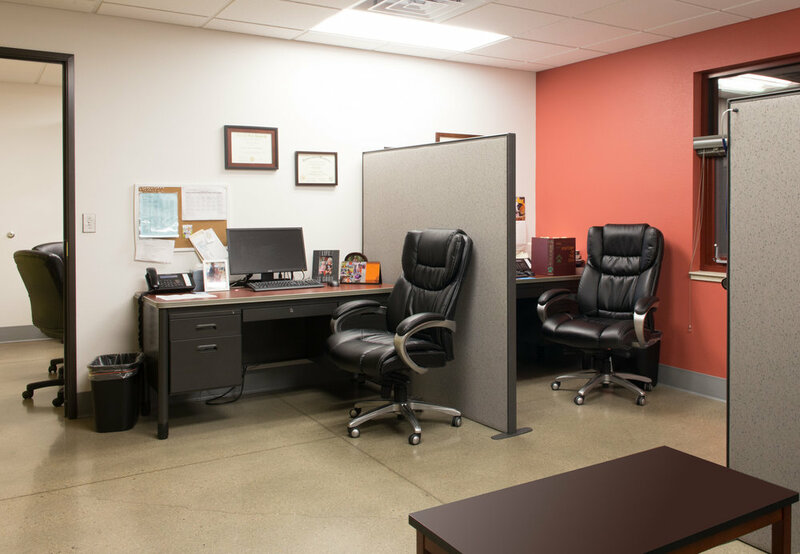 We utilize a total of four examination rooms, one of which is designated solely as a feline room. We have an isolation ward which minimizes exposure of infectious disease patients with any of the other hospital or boarding areas. We also offer designated feline and canine hospital wards, to minimize contact and/or stress associated with mixing feline and canine patients. 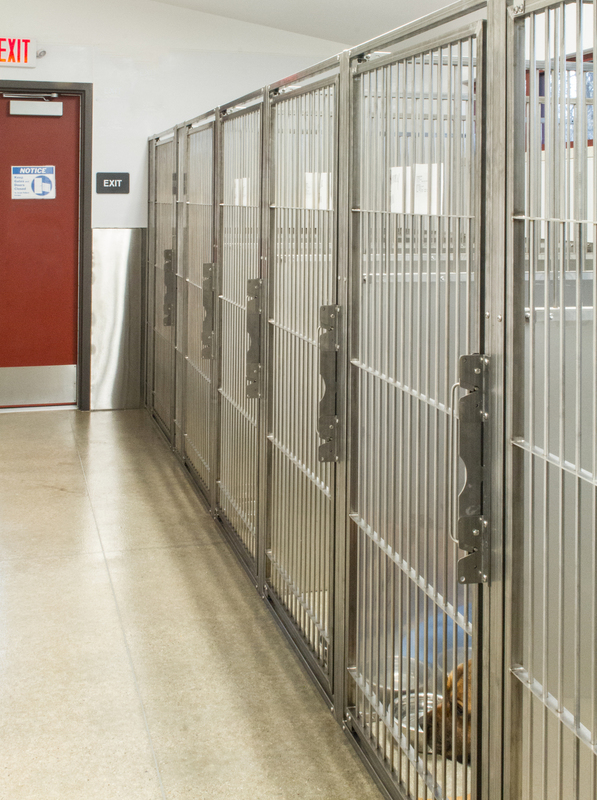 Both dogs and cats have boarding areas that are segregated from hospitalized patients. Intensive and critical patients are located in the treatment area for constant supervision and care. We welcome your questions about our boarding facilities and policies and are eager to discuss how we can make your pet’s stay as happy as possible, while alleviating any concerns you may have about leaving your pet while you travel. Let us answer all your questions and put your concerns to rest! Call today to learn about our accommodations and boarding policies, or to schedule your pet’s stay. Mountain View Veterinary Hospital also offers on-site cremation services. We offer a variety of urns, pendants, and clay paw prints in memory of your beloved friend. Our Cremation Services are done on site in a separate building than the hospital. Remains are processed individually and cared for by our staff; the staff you know and are familiar with. We have urns and other pieces in stock for clients to choose from. Feel free to contact us by phone or email with any of your questions or concerns. We promise to provide you answers as soon as they become available.